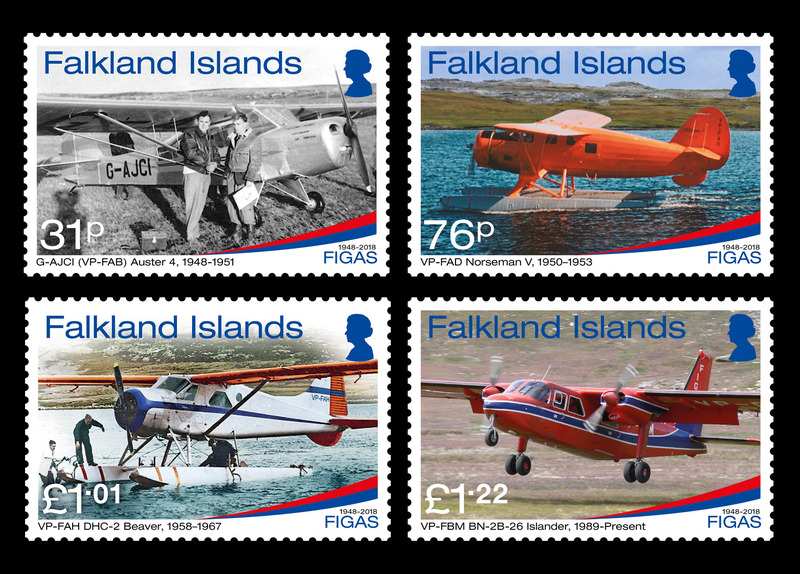 Pobjoy Stamps has released details of four new stamps issued on behalf of the Falkland Islands to mark seven decades of FIGAS, the government air service of the Falkland Islands. The Falkland Islands Government Air Services (FIGAS) has been a crucial part of Falkland life since 1948, when the Falkland Islands Government purchased two light single engine Auster aircraft. Captain Vic Spencer was appointed as the first FIGAS pilot along with Maurice Smith as first engineer. The aircraft arrived in the Falklands in November and were assembled at the Stanley racecourse which was originally used to take off and land. The first test flight was conducted from there by Vic Spencer on 19 December 1948. Shortly after this first test flight, on 24 December, a small girl suffering from Peritonitis was flown from North Arm settlement to Stanley. This resulted in the first passenger/medical flight undertaken in the Falklands. Seventy years later, FIGAS remains an essential part of the Falklands transport infrastructure and way of life. The fleet now consists of five Islanders, one of which is a dedicated Maritime Patrol aircraft. Flying is becoming increasingly more seasonal with ground-based tourists; Cruise Liner passengers and local passengers making up most of the traffic. Round Robin flights, freight, fishery zone surveillance patrols, commercial charter operations and scenic flights complement the core business. For more information, or to place an order, visit Pobjoy Stamps.